"Chromatic" redirects here. For other uses, see Chromatic (disambiguation). Melodies can be based on a diatonic scale and maintain its tonal characteristics but contain many accidentals, up to all twelve tones of the chromatic scale, such as the opening of Henry Purcell's Thy Hand, Belinda, Dido and Aeneas (1689) ( Play (help·info), Play (help·info) with figured bass), which features eleven of twelve pitches while chromatically descending by half steps, the missing pitch being sung later. Béla Bartók - Music for Strings, Percussion and Celesta, mov. I, fugue subject: chromatic Play (help·info). Bartok - Music for Strings, Percussion and Celesta, mov. I, fugue subject: diatonic variant Play (help·info). Diatonic (Greek: διατονική) and chromatic (Greek: χρωματική) are terms in music theory that are most often used to characterize scales, and are also applied to musical instruments, intervals, chords, notes, musical styles, and kinds of harmony. They are very often used as a pair, especially when applied to contrasting features of the common practice music of the period 1600–1900. These terms may mean different things in different contexts. Very often, diatonic refers to musical elements derived from the modes and transpositions of the "white note scale" C–D–E–F–G–A–B. In some usages it includes all forms of heptatonic scale that are in common use in Western music (the major, and all forms of the minor). Chromatic most often refers to structures derived from the twelve-note chromatic scale, which consists of all semitones. Historically, however, it had other senses, referring in Ancient Greek music theory to a particular tuning of the tetrachord, and to a rhythmic notational convention in mensural music of the 14th through 16th centuries. Tetrachord genera of the four-string lyre, from The History of the Arts and Sciences of the Antients, Charles Rollin (1768). 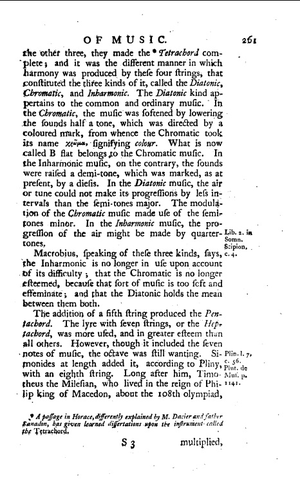 The text gives a typically fanciful account of the term chromatic. is F♮ lowered by a quarter tone). For all three tetrachords, only the middle two strings varied in their pitch. , commonly used for the notation of sacred music. These uses for the word have no relationship to the modern meaning of chromatic, but the sense survives in the current term coloratura. The term chromatic began to approach its modern usage in the 16th century. For instance Orlando Lasso's Prophetiae Sibyllarum opens with a prologue proclaiming, "these chromatic songs, heard in modulation, are those in which the mysteries of the Sibyls are sung, intrepidly," which here takes its modern meaning referring to the frequent change of key and use of chromatic intervals in the work. (The Prophetiae belonged to an experimental musical movement of the time, called musica reservata). This usage comes from a renewed interest in the Greek genera, especially its chromatic tetrachord, notably by the influential theorist Nicola Vicentino in his treatise on ancient and modern practice, 1555. Diatonic scale on C equal tempered and just. Gamut as defined by George William Lemon, English Etymology, 1783. Medieval theorists defined scales in terms of the Greek tetrachords. The gamut was the series of pitches from which all the Medieval "scales" (or modes, strictly) notionally derive, and it may be thought of as constructed in a certain way from diatonic tetrachords. The origin of the word gamut is explained at the article Guidonian hand; here the word is used in one of the available senses: the all-encompassing gamut as described by Guido d'Arezzo (which includes all of the modes). In its most strict definition, therefore, a diatonic scale is one that may be derived from the pitches represented in successive white keys of the piano (or a transposition thereof): the modern equivalent of the gamut. [vague] (For simplicity, throughout this article equal temperament tuning is assumed unless otherwise noted.) This would include the major scale, and the natural minor scale (same as the descending form of the melodic minor), but not the old ecclesiastical church modes, most of which included both versions of the "variable" note B♮/B♭. There are specific applications in the music of the Common Practice Period, and later music that shares its core features. Some writers consistently classify the other variants of the minor scale – the melodic minor (ascending form) and the harmonic minor – as non-diatonic, since they are not transpositions of the white-note pitches of the piano. Among such theorists there is no agreed general term that encompasses the major and all forms of the minor scale. Some writers consistently include the melodic and harmonic minor scales as diatonic also. For this group, every scale standardly used in common practice music and much similar later music is either diatonic (the major, and all forms of the minor) or chromatic. Still other writers mix these two meanings of diatonic (and conversely for chromatic), and this can lead to confusions and misconceptions. Sometimes context makes the intended meaning clear. Some other meanings of the term diatonic scale take the extension to harmonic and melodic minor even further, to be even more inclusive. In general, diatonic is most often used inclusively with respect to music that restricts itself to standard uses of traditional major and minor scales. When discussing music that uses a larger variety of scales and modes (including much jazz, rock, and some tonal 20th-century concert music), writers often adopt the exclusive use to prevent confusion. A chromatic scale consists of an ascending or descending sequence of pitches, always proceeding by semitones. Such a sequence of pitches is produced, for example, by playing all the black and white keys of a piano in order. The structure of a chromatic scale is therefore uniform throughout—unlike major and minor scales, which have tones and semitones in particular arrangements (and an augmented second, in the harmonic minor). Some instruments, such as the violin, can be played in any scale; others, such as the glockenspiel, are restricted to the scale to which they are tuned. Among this latter class, some instruments, such as the piano, are always tuned to a chromatic scale, and can be played in any key, while others are restricted to a diatonic scale, and therefore to a particular key. Some instruments, such as the harmonica, harp, and glockenspiel, are available in both diatonic and chromatic versions (although it is possible to play chromatic notes on a diatonic harmonica, they require extended embouchure techniques, and some chromatic notes are only usable by advanced players). Because diatonic scale is itself ambiguous, distinguishing intervals is also ambiguous. For example, the interval B♮–E♭ (a diminished fourth, occurring in C harmonic minor) is considered diatonic if the harmonic minor scale is considered diatonic; but it is considered chromatic if the harmonic minor scale is not considered diatonic. Additionally, the label chromatic or diatonic for an interval may be sensitive to context. For instance, in a passage in C major, the interval C–E♭ could be considered a chromatic interval because it does not appear in the prevailing diatonic key; conversely in C minor it would be diatonic. This usage is still subject to the categorization of scales as above, e.g. in the B♮–E♭ example above, classification would still depend on whether the harmonic minor scale is considered diatonic. In equal temperament, there is no difference in tuning (and therefore in sound) between intervals that are enharmonically equivalent. For example, the notes F and E♯ represent exactly the same pitch, so the diatonic interval C–F (a perfect fourth) sounds exactly the same as its enharmonic equivalent—the chromatic interval C–E♯ (an augmented third). In systems other than equal temperament, however, there is often a difference in tuning between intervals that are enharmonically equivalent. In tuning systems that are based on a cycle of fifths, such as Pythagorean tuning and meantone temperament, these alternatives are labelled as diatonic or chromatic intervals. Under these systems the cycle of fifths is not circular in the sense that a pitch at one end of the cycle (e.g., G♯) is not tuned the same as the enharmonic equivalent at its other end (A♭); they are different by an amount known as a comma. This broken cycle causes intervals that cross the break to be written as augmented or diminished chromatic intervals. In meantone temperament, for instance, chromatic semitones (E–E♯) are smaller than diatonic semitones (E–F), and with consonant intervals such as the major third the enharmonic equivalent is generally less consonant. If the tritone is assumed diatonic, the classification of written intervals by this definition is not significantly different from the "drawn from the same diatonic scale" definition given above as long as the harmonic minor and ascending melodic minor scale variants are not included. Diatonic chords are generally understood as those that are built using only notes from the same diatonic scale; all other chords are considered chromatic. However, given the ambiguity of diatonic scale, this definition, too, is ambiguous. And for some theorists, chords are only ever diatonic in a relative sense: the augmented triad E♭–G–B♮ is diatonic "to" or "in" C minor. On this understanding, the diminished seventh chord built on the leading note is accepted as diatonic in minor keys. Often musicians call diatonic harmony any kind of harmony inside the major–minor system of common practice. When diatonic harmony is understood in this sense, the supposed term chromatic harmony means little, because chromatic chords are also used in that same system. At other times, especially in textbooks and syllabuses for musical composition or music theory, diatonic harmony means harmony that uses only "diatonic chords". According to this usage, chromatic harmony is then harmony that extends the available resources to include chromatic chords: the augmented sixth chords, the Neapolitan sixth, chromatic seventh chords, etc. Since the word harmony can be used of single classes of chords (dominant harmony, E minor harmony, for example), diatonic harmony and chromatic harmony can be used in this distinct way also. Chromatic harmony may be defined as the use of successive chords that are from two different keys and therefore contain tones represented by the same note symbols but with different accidentals. Four basic techniques produce chromatic harmony under this definition: modal interchange, secondary dominants, melodic tension, and chromatic mediants. A clear illustration of the contrast between chromatic and diatonic harmony may be found in the slow movement of Beethoven’s Piano Concerto No. 4, Op. 58. The long, flowing melody of the first five bars is almost entirely diatonic, consisting of notes within the scale of E minor, the movement’s home key. The only exception is the G sharp in the left hand in the third bar. By contrast, the remaining bars are highly chromatic, using all the notes available to convey a sense of growing intensity as the music builds towards its expressive climax. A further example may be found in this extract from Act III of Richard Wagner’s opera Die Walkure . The first four bars harmonize a descending chromatic scale with a rich, intoxicating chord progression. In contrast, the remaining three bars are entirely diatonic, using notes only within the scale of E major. The passage is intended to convey the god Wotan putting his daughter Brunnhilde into a deep sleep. In modern usage, the meanings of the terms diatonic note and chromatic note vary according to the meaning of the term diatonic scale. Generally – not universally – a note is understood as diatonic in a context if it belongs to the diatonic scale that is used in that context; otherwise it is chromatic. Alteration of a note that makes it (or the harmony that includes it) chromatic rather than diatonic. Melodic movement between a diatonic note and a chromatically altered variant (from C to C♯ in G major, or vice versa, for example). Movement between harmonies that are not elements of any common diatonic system (that is, not of the same diatonic scale: movement from D–F–A to D♯–F♯–A, for example). The same as the second sense of chromatic inflection, above. In musica ficta and similar contexts, a melodic fragment that includes a chromatic semitone, and therefore includes a chromatic inflection in the second sense, above. Movement between harmonies that both belong to at least one shared diatonic system (from F–A–C to G–B–E, for example, since both occur in C major). Diatonic modulation is modulation via a diatonic progression. Chromatic modulation is modulation via a chromatic progression, in the first sense given above. One very common kind of pentatonic scale that draws its notes from the diatonic scale (in the exclusive sense, above) is sometimes called the diatonic pentatonic scale: C–D–E–G–A[–C], or some other modal arrangement of those notes. Other pentatonic scales (such as the pelog scales) may also be construed as reduced forms of a diatonic scale, but are not labelled diatonic. Traditionally, and in all uses discussed above, the term diatonic has been confined to the domain of pitch, and in a fairly restricted way. Exactly which scales (and even which modes of those scales) should count as diatonic is unsettled, as shown above. But the broad selection principle itself is not disputed, at least as a theoretical convenience. The selection of pitch classes can be generalised to encompass formation of non-traditional scales from the underlying twelve chromatic pitch classes. Or a larger set of underlying pitch classes may be used instead. For example, the octave may be divided into varying numbers of equally spaced pitch classes. The usual number is twelve, giving the conventional set used in Western music. But Paul Zweifel uses a group-theoretic approach to analyse different sets, concluding especially that a set of twenty divisions of the octave is another viable option for retaining certain properties associated with the conventional "diatonic" selections from twelve pitch classes. It is possible to generalise this selection principle even beyond the domain of pitch. The diatonic idea has been applied in analysis of some traditional African rhythms, for example. Some selection or other is made from an underlying superset of metrical beats, to produce a "diatonic" rhythmic "scale" embedded in an underlying metrical "matrix". Some of these selections are diatonic in a way similar to the traditional diatonic selections of pitch classes (that is, a selection of seven beats from a matrix of twelve beats – perhaps even in groupings that match the tone-and-semitone groupings of diatonic scales). But the principle may also be applied with even more generality (including even any selection from a matrix of beats of any size). ^ Benward & Saker (2003). Music: In Theory and Practice, Vol. I, p.38. Seventh Edition. ISBN 978-0-07-294262-0. ^ a b Leeuw, Ton de (2005). Music of the Twentieth Century, p.93. ISBN 90-5356-765-8. ^ Often diatonic and chromatic are treated as mutually exclusive opposites, concerning common practice music. This article deals mainly with common practice music, and later music that shares the same core features (including the same particular use of tonality, harmonic and melodic idioms, and types of scales, chords, and intervals). Where other music is dealt with, this is specially noted. ^ This definition encompasses the natural minor scale (and equivalently the descending melodic minor), the major scale, and the ecclesiastical modes. ^ For inclusion of the harmonic minor and the ascending melodic minor see the section Modern meanings of "diatonic scale" in this article. ^ Translating the term used by Greek theorists: γένος, génos; plural γένη, génē. ^ It is unclear whether the lyre in question was itself a presumed four-stringed instrument ("τετράχορδον ὄργανον"), as some have suggested (see Peter Gorman, Pythagoras, a Life (London: Routledge & K. Paul, 1979), p. 162: "The fundamental instrument of early Greek music was the tetrachord or four-stringed lyre, which was tuned in accordance with the main concordances; the tetrachord was also the foundation of Greek harmonic theory"). The number of strings on early lyres and similar instruments is a matter of much speculation (see Martin Litchfield West, Ancient Greek music (Oxford and New York: Oxford University Press, 1994), especially pp. 62–64). Many later instruments had seven or perhaps more strings, and in that case the tetrachord must be thought of as based on a selection of four adjacent strings. ^ The English word diatonic is ultimately from the Greek διατονικός (diatonikós), itself from διάτονος (diátonos), which may mean (as OED claims) "through the tones" (taking τόνος, tónos, to mean interval of a tone), or perhaps stretched out (as recorded in Liddell and Scott's Greek Lexicon). See also Barsky (Chromaticism, Barsky, Vladimir, Routledge, 1996, p. 2): "There are two possible ways of translating the Greek term 'diatonic': (1) 'running through tones', i.e. through the whole tones; or (2) a 'tensed' tetrachord filled up with the widest intervals". The second interpretation would be justified by consideration of the pitches in the diatonic tetrachord, which are more equally distributed ("stretched out") than in the chromatic and enharmonic tetrachords, and are also the result of tighter stretching of the two variable strings. It is perhaps also sounder on linguistic morphological grounds. (See also Merriam-Webster Online.) A completely separate explanation of the origins of the term diatonic appeals to the generation of the diatonic scale from "two tones": "Because the musical scale is based entirely on octaves and fifths, that is, two notes, it is called the 'diatonic scale' " (Phillips, Stephen, "Pythagorean aspects of music", in Music and Psyche, Vol. 3, available also online). But this ignores the fact that it is the element di- that means "two", not the element dia-, which has "through" among its meanings (see Liddell and Scott). There is a Greek term δίτονος (dítonos), which is applied to an interval equivalent to two tones. It yields the English words ditone and ditonic (see Pythagorean comma), but it is quite distinct from διάτονος. Yet another derivation assumes the sense "through the tones" for διάτονος, but interprets tone as meaning individual note of the scale: "The word diatonic means 'through the tones' (i.e., through the tones of the key)" (Gehrkens, 1914, see below; see also the Prout citation, at the same location). This is not in accord with any accepted Greek meaning, and in Greek theory it would fail to exclude the other tetrachords. The fact that τόνος itself has at least four distinct meanings in Greek theory of music contributes to the uncertainty of the exact meaning and derivation of διατονικός, even among ancient writers. (See Solon Michaelides, The Music of Ancient Greece: An Encyclopaedia (London; Faber and Faber, 1978), pp. 335–40: "Tonos". Τόνος may refer to a pitch, an interval, a "key" or register of the voice, or a mode.) For more information, especially concerning the various exact tunings of the diatonic tetrachord, see Diatonic genus. ^ Chromatic is from Greek χρωματικός (khrōmatikós), itself from χρῶμα (khrṓma), which means complexion, hence colour – or, specifically as a musical term, "a modification of the simplest music" (Liddell and Scott's Greek lexicon). For more information, especially concerning the various exact tunings of the chromatic tetrachord, see Chromatic genus. ^ Occasionally, as in the Rollin excerpt shown in this section, spelt inharmonic; but in OED this is only given as a distinct word with a distinct etymology ("Not harmonic; not in harmony; dissonant,..."). The motivation and sources of the Greek term ἐναρμονικός (enarmonikós) are little understood. But the two roots are ἐν (en: "in") and ἁρμονία (harmonía: "good placement of parts", "harmony", "a scale, mode, or τόνος [in one sense; see notes above]"). So in some way the term suggests harmoniousness or good disposition of parts, but not in the modern sense of harmony, which has to do with simultaneous sounds. (See Solon Michaelides, The Music of Ancient Greece: An Encyclopaedia (London: Faber and Faber, 1978); Liddell and Scott; etc.) For more information, especially concerning the various exact tunings of the enharmonic tetrachord, see Enharmonic genus. ^ In practice tetrachord (τετράχορδον; tetrákhordon) also meant the instrument itself. And it could also mean the interval of a perfect fourth between the pitches of the fixed top and bottom strings; therefore the various tunings were called divisions of the tetrachord (see OED, "Tetrachord"). ^ For general and introductory coverage of Greek theory see Tuning and Temperament, A Historical Survey, Barbour, J. Murray, 2004 (reprint of 1972 edition), ISBN 0-486-43406-0. These meanings in Greek theory are the ultimate source of the meanings of the words today, but through a great deal of modification and confusion in Medieval times. It would therefore be a mistake to consider the Greek system and the subsequent Western systems (Medieval, Renaissance, or contemporary) as closely similar simply because of the use of similar terms: "... the categories of the diatonic, chromatic and enharmonic genera developed within the framework of monodic musical culture and have little in common with the corresponding categories of modern music theory" (Chromaticism, Barsky, Vladimir, Routledge, 1996, p. 2). There were several Greek systems, in any case. What is presented here is merely a simplification of theory that spans several centuries, from the time of Pythagoras (c. 580 BCE – c. 500 BCE), through Aristoxenus (c. 362 BCE – after 320 BCE), to such late theorists as Alypius of Alexandria (fl. 360 CE). Specifically, there are more versions of each of the three tetrachords than are described here. ^ Details of the practice for certain periods: "The device that was both the simplest and the most stable and durable was that known as coloratio. In principle, any note or group of notes subjected to coloration or blackening was reduced to two-thirds of the value that it would have enjoyed in its pristine state. In respect of any note in mensural notation that was equal in duration to two of that next smaller in value, the coloration of three in succession caused each to undergo reduction to two-thirds of its erstwhile value, so creating a triplet [... .] In the case of any note that was equal in duration to three of that next smaller, the coloration of three together likewise effected a proportional reduction in the value of each to two-thirds, so reducing perfect value to imperfect and commonly creating the effect called hemiola [... .] On occasions coloured notes could appear singly to denote imperfect value, especially to inhibit unwanted perfection and alteration," Roger Bowers, "Proportional notation", 2. Coloration, New Grove Dictionary of Music and Musicians, second edition, edited by Stanley Sadie and John Tyrrell (London: Macmillan Publishers, 2001). ^ Parrish, Carl, The Notation of Medieval Music, Pendragon, New York, 1978, pp. 147ff. ^ Harvard Dictionary of Music, 2nd ed., "Chromatic". ^ Grout, Donald J, and Palisca, Claude, A History of Western Music, 6th ed., Norton, New York, 2001, pp. 188–190. ^ "The root of the Italian term is that of 'colour', and it is probably related through its use of diminution (the little notes that 'rush' to the next long note, as Bernhard writes) to the mensural practice of coloration" (New Grove, "Coloratura"). ^ Grout et al., 2001, p. 188. ^ Some theorists[weasel words] derive such a scale from a certain series of pitches rising by six perfect fifths: F–C–G–D–A–E–B. These pitches are then rearranged by transposition to a single-octave scale: C–D–E–F–G–A–B[–C] (the standard C major scale, with the interval structure T–T–S–T–T–T[–S]). A few theorists[weasel words] call the original untransposed series itself a "scale". Percy Goetschius calls that series the "natural scale" (The Theory and Practice of Tone-Relations, Schirmer, 1931 edition, p. 3; see further citation below). ^ Goetschius, as cited below, accepts only the major as diatonic. ^ The first "exclusive" usage seems to be gaining greater currency. Certainly it is becoming close to standard in academic writing, as can be seen by querying online archives (such as JSTOR) for recent uses of the term diatonic. Equally certainly, the second "inclusive" meaning is still strongly represented in non-academic writing (as can be seen by online searches of practically oriented music texts at, for example, Amazon.com). Overall, considerable confusion remains; on the evidence presented in the list of sources, there are very many sources in the third category: Diatonic used vaguely, inconsistently, or anomalously. ^ A very clear statement of the "exclusive" stance is given in the excerpt from "The leading tone in direct chromaticism: from Renaissance to Baroque", Clough, John, 1957, below. The excerpt acknowledges and analyses the difficulties with logic, naming, and taxonomy in that stance. ^ A few exclude only the harmonic minor as diatonic, and accept the ascending melodic, because it comprises only tones and semitones, or because it has all of its parts analysable as tetrachords in some way or other. ^ However, beyond analysis of common practice music, even these writers do not typically consider non-standard uses of some familiar scales to be diatonic. For example, unusual modes of the melodic or harmonic minor scale, such as used in early works by Stravinsky, are almost never described as "diatonic". A "diatonic" scale is a scale formed from two intervals of different sizes, such that groups of several adjacent instances of the larger interval are separated by single instances of the smaller interval. A "pentatonic" scale is a scale formed from two intervals of different sizes, such that groups of several adjacent instances of the smaller interval are separated by single instances of the larger interval. Therefore a generic "pentatonic" can contain more than five tones. "Chromatic" refers to the interval formed between adjacent pitch-classes of any equal-tempered scale. See also #Extended pitch selections, in this article. See also an exceptional usage by Persichetti, in a note to #Diatonic_pentatonic_scale, below. ^ It is not usual to use chromatic scale in any other sense. A rare exception is found in Elements of Musical Composition, Crotch, William, 1830. (See the quotation from this text, below. See also extensive analysis in the excerpt from "The leading tone in direct chromaticism: from Renaissance to Baroque", Clough, John, 1957, in the same subsection below.) Outside of music altogether, chromatic scale may refer to Von Luschan's chromatic scale. ^ There are several other understandings of the terms diatonic interval and chromatic interval. There are theorists[weasel words] who define all augmented and diminished intervals as chromatic, even though some of these occur in scales that everyone accepts as diatonic. (For example, the diminished fifth formed by B and F, which occurs in C major.) There are even some writers who define all minor intervals as chromatic (Goetschius, Percy, The Theory and Practice of Tone-Relations, 1931, p. 6; Goetschius assesses all intervals as if the lower note were the tonic, and since for him only the major scale is diatonic, only the intervals formed above the tonic in the major are diatonic; see also, for example, Harrison, Mark, Contemporary Music Theory – Level Two, 1999, p. 5). Some theorists take the diatonic interval to be simply a measure of the number of "scale degrees" spanned by two notes (so that F♯–E♭ and F♮–E♮ represent the same "diatonic interval": a seventh); and they use the term chromatic interval to mean the number of semitones spanned by any two pitches (F♯ and E♭ are "at a chromatic interval of nine semitones"). Some theorists use the term diatonic interval to mean "an interval named on the assumption of the diatonic system of Western music" (so that all perfect, major, minor, augmented, diminished intervals are "diatonic intervals"). It is not clear what chromatic interval would mean, if anything, in parallel with this usage for diatonic. Some theorists use chromatic interval to mean simply semitone, as for example in the article Chromatic fourth. See also Williams, Peter F., The Chromatic Fourth during Four Centuries of Music, OUP, 1997. Something close to this usage may be found in print. For example, the term chromatically, as used in: "The trill rises chromatically by step above this harmonic uncertainty, forming a chromatic fourth, ..." (Robin Stowel, Beethoven: Violin Concerto (Cambridge Music Handbooks), Cambridge and New York: Cambridge University Press, 2005, p. 66). The term as used in the phrase chromatic fourth itself perhaps means just what it means in chromatic scale, but here applied to a melodic interval rather than a scale. ^ See for example the citation from Grove Music Online ("Diatonic"), below. ^ Helmholtz, Hermann, trans. Alexander Ellis, On the Sensations of Tone, Dover, New York, 1954, pp. 433–435 and 546–548. The two notes of a diatonic semitone have different letter-names; those of a chromatic semitone have the same letter-name. ^ Kostka, Stefan, and Payne, Dorothy, Tonal Harmony, McGraw-Hill, 5th edition, 2003, pp. 60–61. ^ "Because of the variability of [scale degrees] 6 and 7, there are sixteen possible diatonic seventh chords in minor ... [One line in a table headed Common diatonic seventh chords in minor:] __º7_____viiº7__" (Tonal harmony, Kostka, Stefan and Payne, Dorothy, McGraw-Hill, 3rd edition 1995, pp. 64–65). ^ This is because the third of the triad does not belong to the natural minor scale or Aeolian mode of C minor (C, D, E♭, F, G, A♭, B♭). This highly restrictive interpretation is effectively equivalent to the idea that diatonic triads are those drawn from the notes of the major scale alone, as this source rather roughly puts it: "Diatonic chords are wholly contained within a major scale" (Harrison, Mark, Contemporary Music Theory – Level Two, 1999, p. 7). ^ Often the content of "diatonic harmony" in this sense includes such harmonic resources as diminished sevenths on the leading note – possibly even in major keys – even if the text uses a classification for chords that should exclude those resources. ^ Some of these are chords "borrowed" from a key other than the prevailing key of a piece; but some are not: they are derivable only by chromatic alteration. ^ a b Tischler, H. (1958). "Re: Chromatic Mediants: A Facet of Musical Romanticism". Journal of Music Theory. 2 (1): 94–97. doi:10.2307/842933. JSTOR 842933. ^ "... most chromatic harmony can be read as diatonic harmony with chromatic inflection", a view attributed to Simon Sechter in New Grove, "Analysis", §II: History 3. ^ "A chromatic progression is one between harmonies with no diatonic relationship, harmonies that do not coexist in any single diatonic system of key and mode. For this purpose, the harmonic form of the minor scale is considered the tonal-harmonic basis of its diatonic system. A usual characteristic of the chromatic progression is chromatic inflection – the change of one or more notes from one form (sharp, natural, or flat) to another" Wallace Berry, Form in Music (Prentice-Hall, 1966), pp. 109–110, note 5. ^ Wallace Berry, Form in Music (Prentice-Hall, 1966), pp. 109–110, note 5. ^ "In [an example] the change from major to minor is supported by the chromatic progression ... in the bass" Structural Functions of Harmony, Schoenberg, Arnold, Faber & Faber, 1983, p. 54. ^ a b See New Grove Online, "Musica Ficta", I, ii, cited earlier. ^ See Form in Music, Berry, Wallace, Prentice-Hall, 1966, pp. 109–110, note 5. The author even includes movement between tonic and Neapolitan sixth harmonies (in both major and minor), because there exists some diatonic system in which both harmonies occur. With C major, for example, both occur in the subdominant minor, F minor. ^ a b Berry, Form in Music, p. 125, note 2. ^ Twentieth-Century Harmony, Persichetti, Vincent, Norton, 1961, pp. 50–51. Persichetti also makes an exceptional use of the term diatonic scale in this context: "Diatonic scales of five tones are harmonically limited ...". ^ Zweifel, P. F. (1996). "Generalized Diatonic and Pentatonic Scales: A Group-Theoretic Approach". Perspectives of New Music. 34 (1): 140–161. doi:10.2307/833490. JSTOR 833490. ^ Rahn, J. (1996). "Turning the Analysis around: Africa-Derived Rhythms and Europe-Derived Music Theory". Black Music Research Journal. 16 (1): 71–89. doi:10.2307/779378. JSTOR 779378.